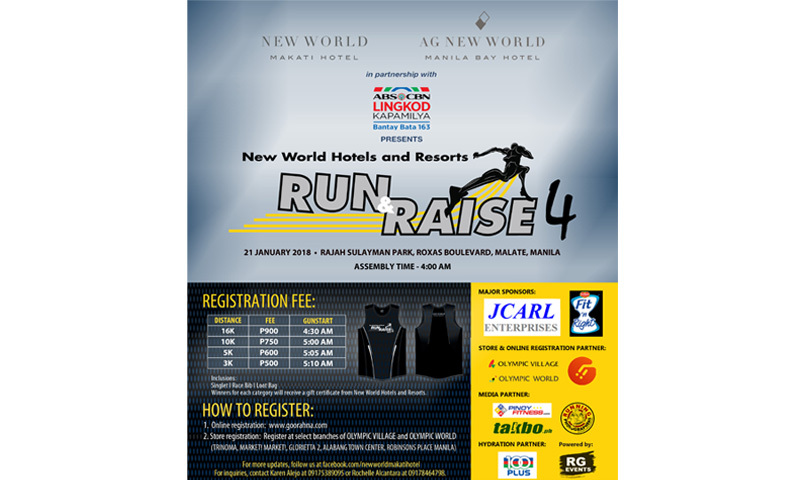 New World Hotels and Resorts gears up for another exciting edition of Run & Raise in 2018. Now on its fourth year, Run & Raise 4 will be held at the Rajah Sulayman Park, Roxas Boulevard, Malate, Manila, on 21 January 2018. Proceeds will benefit ABS-CBN Lingkod Kapamilya Foundation Inc.
New World Hotels and Resorts Run and Raise started as a small-scale charity fun run in 2015. In the past years, Run and Raise continued to improve by increasing number of participants and moving to bigger venues. Through these initiatives, New World Hotels & Resorts is able to support and give back to local and global communities through a number of ways, including offering financial support to victims of natural disasters and educational opportunities to children, to committing to recycling and conservation efforts and providing career-enhancing training for all associates. Registration fees are priced at PHP500 for 3-kilometer distance run, PHP600 for 5K, PHP750 for 10K, and PHP900 for 16K, inclusive of singlet, race bib, and loot bag. Gun start is at 4:30 a.m. Winners of each category will receive exclusive gifts from New World Makati Hotel and AG New World Manila Bay. Sign up from 28 September 2017 to 10 January 2018 at Olympic Village stores at Trinoma, Glorietta 2, Market! Market!, Alabang Town Center, and Robinsons Ermita, or online through www.goorahna.com.